Scooper - Technology News: Is China pursuing two incompatible economic goals? Is China pursuing two incompatible economic goals? As Chinese policymakers attempt to address what ails their country’s economy, they are pursuing two goals that will almost certainly turn out to be incompatible. Very seldom have central banks been able to maintain a fixed exchange rate over an extended period of time while providing liquidity to troubled banks and an ailing economy. Indeed, the task becomes especially difficult as the monetary stringency needed to prop up the currency intensifies strains on domestic banks and the real economy. Those looking for a rough outline of the Chinese economy’s future would be wise to revisit what happened in Thailand in 1997, when the collapse of the baht precipitated the Asian financial crisis. Of course, China in 2016 is different in many ways from Thailand in 1997; but there are key similarities in their responses to ongoing capital outflows. After a prolonged credit boom, commercial banks typically face a mounting volume of nonperforming loans. The natural monetary-policy response is to increase liquidity, lower interest rates, and, in many cases, provide direct assistance in the form of loans from the central bank. This was exactly what was done, for example, in advanced economies after the 2008 financial crisis. But lowering interest rates and easing monetary conditions to support the exchange rate is not a wise course of action when confidence in the currency and the economy is faltering, foreign investors are pulling their money out of the country, and domestic residents are trying to do the same. No matter how justifiable such a policy may be on other grounds, the result in such circumstances is almost always more capital flight and mounting reserve losses. History shows that when an economy starts to sputter, central banks find it extremely difficult to resist domestic calls for action. This is especially true when the emergence of systemic banking problems calls for support from a lender of last resort. In our academic work , Graciela Kaminsky of George Washington University and I have shown how, as financial markets have been liberalized and become globally integrated, banking-sector problems have regularly set the stage for currency crashes. To be sure, capital controls can buy some time; just how much depends on their design, how zealously they are enforced, and other institutional arrangements. Thailand introduced controls on outflows in 1997, and China tightened its controls earlier this year. Similarly, a large war chest of reserves can help hold off the crisis for a while. But buying time is not the same as reversing the trend. Indeed, the People’s Bank of China’s foreign-exchange reserves peaked in mid-2014. Since then, they have diminished by 20%. From 2003 to 2012, many central banks, including China’s, became accustomed to managing large capital inflows. In order to keep their currencies from appreciating, they bought dollars (thus accumulating foreign-exchange reserves). They also offset the expansionary effects of the accumulation of reserves by, among other things, increasing their commercial banks’ reserve requirements. 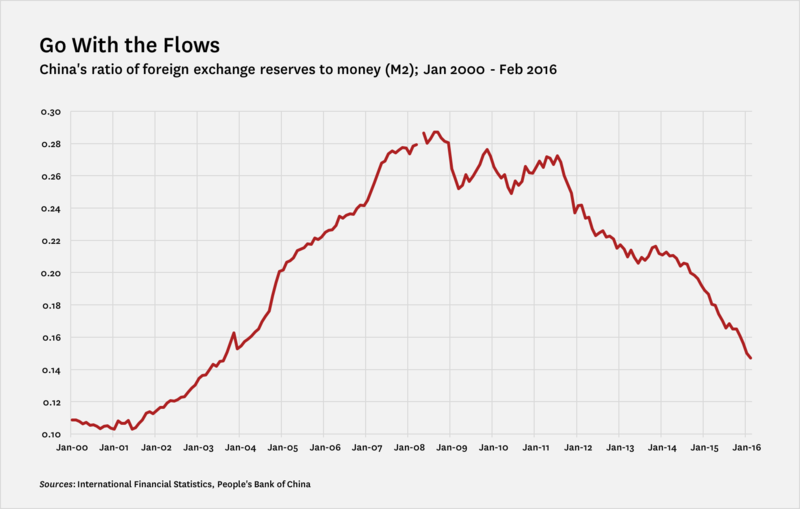 As a consequence of this policy, China’s ratio of foreign-exchange reserves to money rose spectacularly, roughly doubling from 2003 to 2008. Since 2008, however, much of the Chinese policy stimulus in response to the global financial crisis has taken the form of a markedly expansionary monetary and credit policy. As a result, money growth outpaced reserve accumulation during the 2008-2014 period. The monetary expansion has persisted since 2014, even as international reserves have diminished. If one looks at the reserves-to-money ratio, the reversal is even starker than that suggested by looking at reserve data alone. Indeed, the ratio has fallen back to 2003 levels. Given that the share of US-dollar-denominated Chinese corporate debt, though low by international standards, rose markedly in recent years, the reserve-to-money ratio may be as informative as the headline $3.2 trillion reserve number. China’s commitment to keeping the exchange rate steady appears to be incompatible with its recent turn toward more accommodative monetary policies. Efforts to sterilize capital outflows often end poorly. If the PBOC is to prioritize financial stability and commit to fulfilling its role as a lender of last resort, it may be preferable to accept that devaluation in inevitable – before the country’s foreign-exchange reserves are depleted. China may find it advisable to allow the renminbi to float sometime soon, rather than waiting until a full-fledged confidence crisis forces its hand.